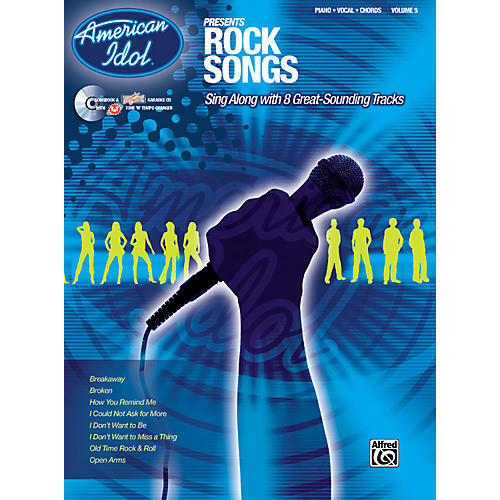 Sing along with your favorite American Idol songs! Each songbook provides the lyrics, piano notation, and chords to eight great hits, with lyrics-only pages included. There are two versions of every one the songs on the CD: a full-performance track with an amazing sound-alike recording, and a professional instrumental accompaniment backing track so you can sing along. When you use the CD in your Mac or Windows-based computer, the TNT (Tone "N" Tempo) Changer lets you easily change the key and tempo to individualize the playback for just your voice and style. Songs include: Breakaway, Broken, How You Remind Me, I Could Not Ask For More, I Don't Want To Be, I Don't Want To Miss A Thing, Old Time Rock 'n' Roll, and Open Arms.